Leamington Primary School pupils get a fit of the giggles while working through the ins and outs of the new water park, opened on February 28. They are, from left, Evie Ball, Oliver Eggleston, Riylan Steenson, Cassie Ridgway and Ruby Pfeiffer. An interactive water park recently opened at Leamington Primary School and intended for both school and community use, is a first for Cambridge. The $200,000 facility requires users to fully engage with its various elements. Hands are needed to turn water pumps and direct water through channels and up an Archimedes screw to an even higher set of channels. With sand underfoot, a stylish sun-shade above and rock surrounds that will soon encase a water channel, the landscaped park offers a safe play area for kids keen to get stuck into some creative water play. Soon to be put in place are a bridge, a small wooden ‘wendy’ house and timber boxes to hold buckets and spades, plus other accoutrements of beach-type play. 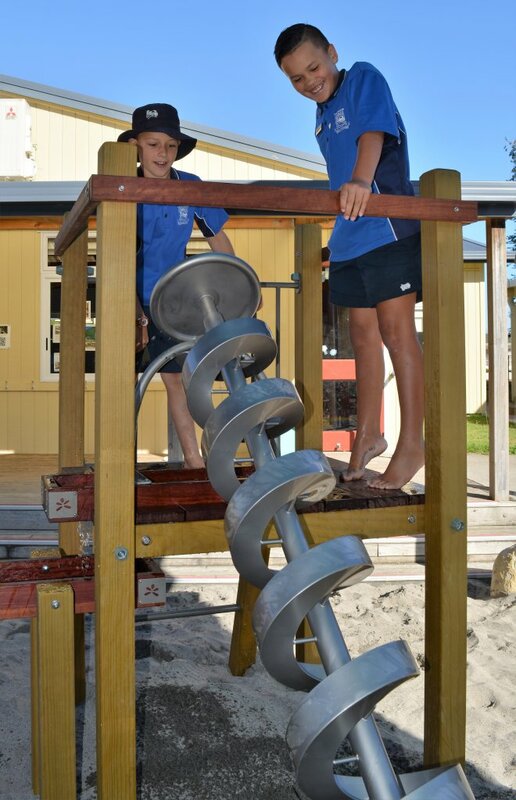 Winding up the Archimedes screw to move water to another level are Dylan Eades and Ricco Wilson. “The great thing about it is that you really have to work with others to make it work,” said Leamington Primary School principal Mike Malcolm, who steered the park’s official unveiling on February 28. Aside from staff and pupils, the opening was attended by representatives from local businesses that have supported the project. All will have their names on a soon-to-be-finished fence that will also carry an illustrated timeline of the park itself. Mike said the idea had evolved during conversations with the school’s Board of Trustees around adding another play area. 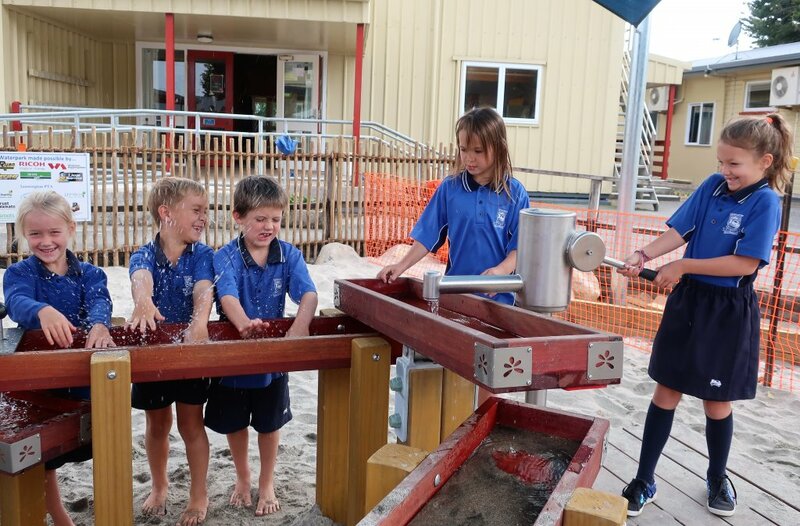 “We took the kids to spend time at a number of Hamilton playgrounds, then asked them to tell us about their favourite bits – they kept just coming back to play ideas related to water,” said Mike. “That’s how we ended up with a water park. I saw something similar over there and said this was what we needed. “Putting it together has been a little more complicated than your conventional playground. The wood we’ve used is the same as is used in wine barrels, and some of the stainless-steel elements of the park had to be imported … one of the tricky parts was bringing in the tonnes of rock we have used. Mike said planning the park had been ongoing for at least two years. 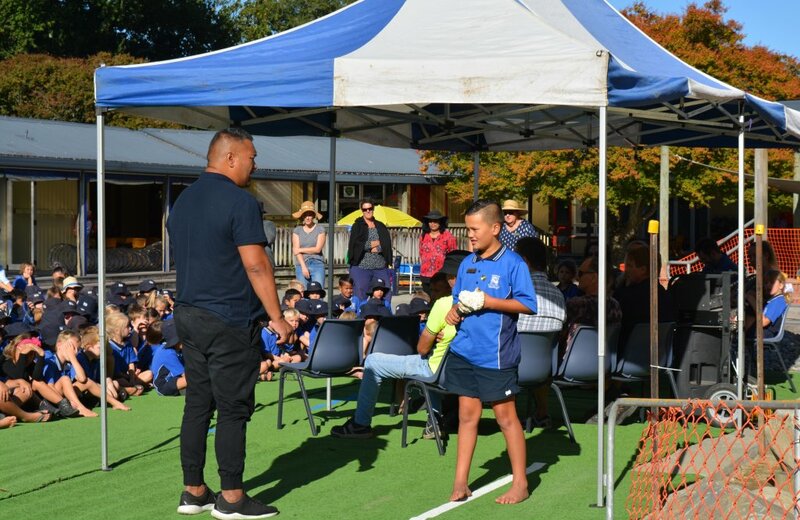 School fundraising had been bolstered by about $30,000 worth of donations from local businesses. Leading the blessing at the water park’s opening is Harry Wilson of Ngati Koroki Kahukura and Ricco Wilson. Mike thanked those who had made the park possible, including the Leamington School PTA. Others included Chris Ryan Plumbing, J Swap Contractors, Waikato Aggregates, Ricoh, On Site Concrete, Nuwave Technology, Little Sparrows, Printech, Noel Silva Bobcats and Florida Landscaping.